Beyond, the UK’s after-hours party hosts, presents its biggest ever event with a 12-hour extravaganza spanning night and day this Bank Holiday Sunday 30 August. 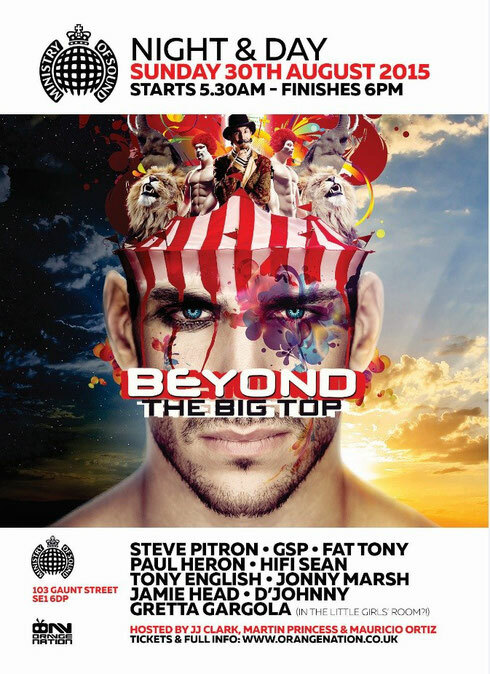 Beyond The Big Top will transform Ministry of Sound into a carnival of the weird and wonderful, featuring performers and random giveaways throughout the night. The two-part event will take over the entire venue, including outdoors in The Courtyard, and will run from 5:30am - 6pm. DJs Tony English, Fat Tony and GSP will control The Box, while Steve Pitron and Jamie Head will provide the outside terrace soundtrack. The Loft sees Jonny Marsh back in town, with 103 featuring D’Johnny, Paul Heron and Hifi Sean. The Baby Box is to be announced. Hi there, just became aware of your blog through Google, and found that it is really informative. I'm going to watch out for brussels. I will be grateful if you continue this in future. Numerous people will be benefited from your writing. Cheers!